Barely days in, and there’s already some really interesting stuff popping up on the new Dungeon Masters Guild site, your only official site for D&D 5e digital content. To clarify, yes, it’s part of the DriveThruRPG network; your same login that works for DTRPG works also for DMG. If you want a full description and explanation of what the Dungeon Master’s Guild is and how it works (including how you can participate by creating and posting your own content), check out this very useful “What is the Dungeon Master’s Guild?” page. 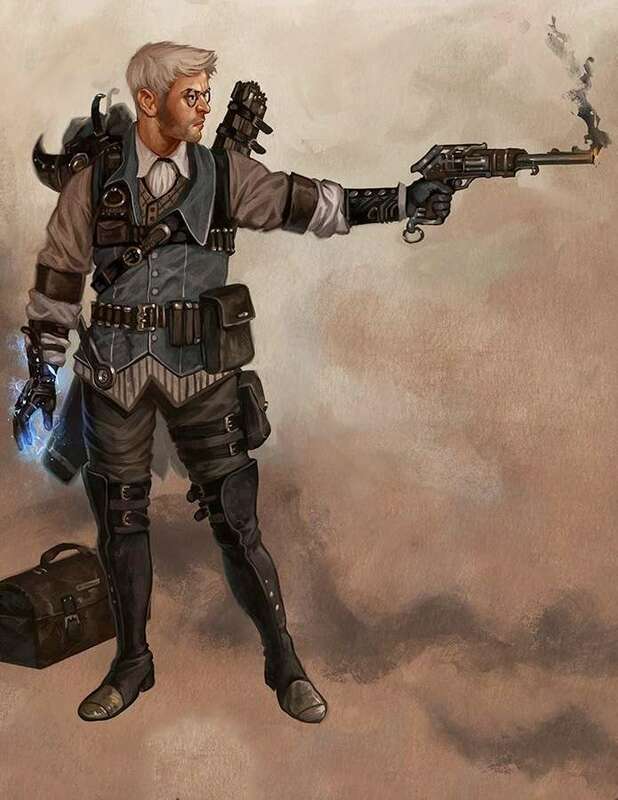 Today’s Pick – the Gunslinger Martial Archetype for Fighters – is a fine example of exactly what is possible for anyone with a desire to create and share their 5th Edition ideas. This one is from Matthew Mercer, with fantastic art by Nick Robles. Pretty fair example of just how to do this. Most warriors and combat specialists spend their years perfecting the classic arts of swordplay, archery, or polearm tactics. Whether duelist or infantry, martial weapons were seemingly perfected long ago, and the true challenge is to master them. However, some minds couldn’t stop with the innovation of the crossbow. Experimentation with alchemical components and rare metals have unlocked the secrets of controlled explosive force. The few who survive these trivals of ingenuity may become the first to create, and deftly wield, the first firearms. This archetype focuses on the ability to design, craft, and utilize powerful, yet dangerous ranged weapons. Through creative innovation and immaculate aim, you become a distant force of death on the battlefield. Inspired by converting from the Pathfinder class, retooled and altered for 5e and making it more my own, I hope you enjoy. Percy! It you think that image looks cool be sure to watch Critical Role on YouTube or twitch to see him in action.